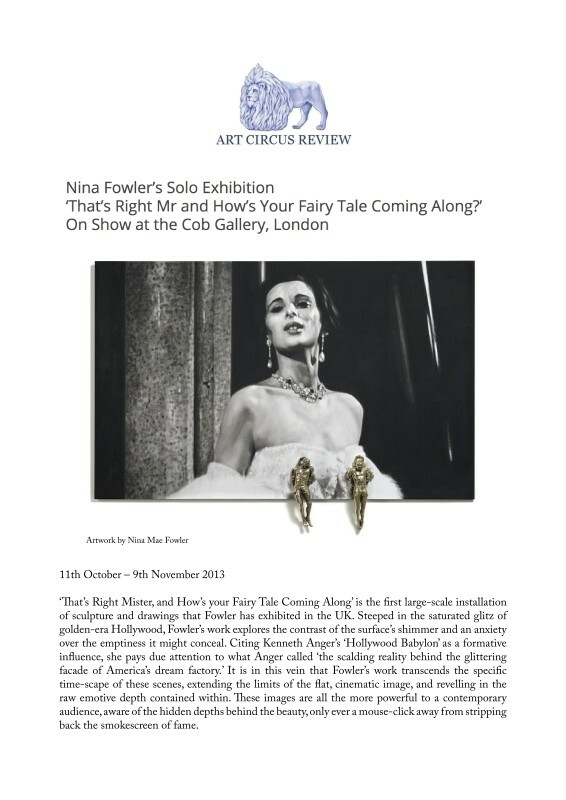 ‘That’s Right Mister, and How’s your Fairy Tale Coming Along’ is the first large-scale installation of sculpture and drawings that Fowler has exhibited in the UK. Steeped in the saturated glitz of golden-era Hollywood, Fowler’s work explores the contrast of the surface’s shimmer and an anxiety over the emptiness it might conceal. Citing Kenneth Anger’s ‘Hollywood Babylon’ as a formative influence, she pays due attention to what Anger called ‘the scalding reality behind the glittering facade of America’s dream factory.’ It is in this vein that Fowler’s work transcends the specific time-scape of these scenes, extending the limits of the flat, cinematic image, and revelling in the raw emotive depth contained within. These images are all the more powerful to a contemporary audience, aware of the hidden depths behind the beauty, only ever a mouse-click away from stripping back the smokescreen of fame.